Scale modeling brings me great joy…and moments of intense frustration. I’m sure you’ve had these mixed emotions, too. 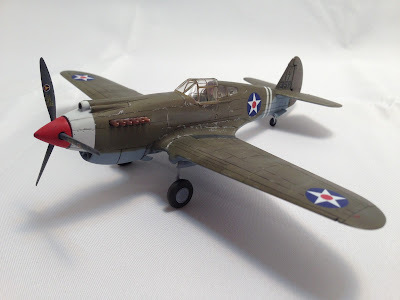 The hobby should be about relaxation, but some models seem to fight you through the entire process of building and painting them, and that was exactly my experience with my last two – yes, two – models. 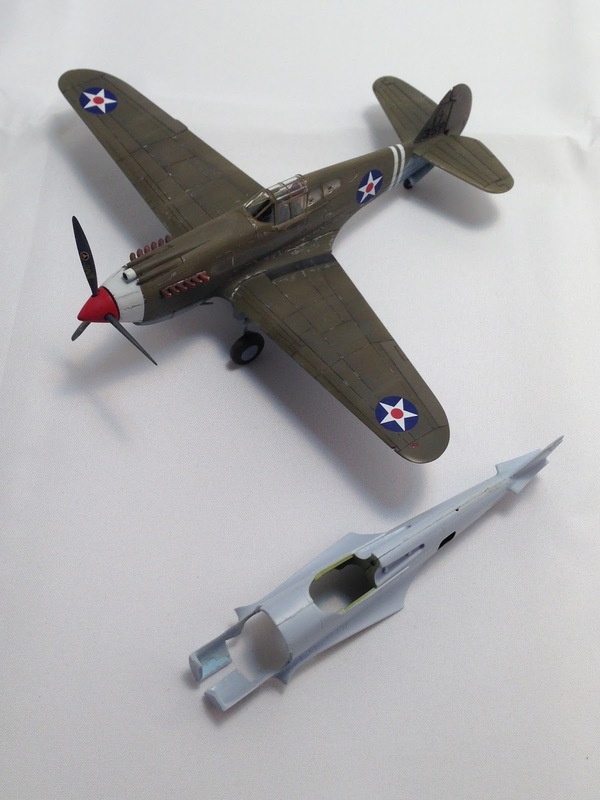 I planned my build of Airfix’s 1/72 P-40B with great optimism. My experience with their 1/72 P-51D confirmed the reports I’d read about the manufacturer’s attention to engineering, so I anticipated the same experience with their Hawk. I hadn’t super detailed a model for a long time, so I bought CMK’s Allison resin engine, replacement spinner and prop, and exhaust stacks, as well as Dana Bell’s excellent book to show me all the great detail that I needed to add. The final product and what remains of my first, scrapped effort. My project went to crap as soon as I removed the engine panels as recommended in CMK’s instructions, and it continued to go south as I tried to determine how the resin parts of the engine should be assembled. Once those panels were removed the front half of the fuselage lost all structural integrity, and it was clear to me as I taped the major pieces together and joined the fuselage to the wings that none of it was going to fit. And as I tried to visualize how to install the engine into the fuselage it was clear to me I was in over my head. I should be honest and forthright and admit that I’m more of an artist than an engineer, but I like to think that with a little time and concentration I can surmount most of the engineering challenges that a model can throw at me. But not this time. I eventually scrapped the model, after having done a good bit of detailing in the cockpit and cutting open the cargo hatch on the port side of the fuselage, and purchased a new kit via Amazon. I began the replacement with lowered expectations, but even it didn’t work out so well. I opened that same cargo hatch and detailed the interior of the fuselage only to discover that the opening was too large. I tried to fix it but the results were shabby. I finally filled the opening, sanded it smooth, and rescribed the panel lines. I ultimately finished the model, although even in its final moments I encountered further issues. When I attached the landing gear the airplane seemed to sit a bit too nose-high, so I pull them out, cut them down a bit, and re-attached them. The slight change of angle from that minor “improvement” resulted in the pre-flattened tires provided in the Airfix kit from not sitting completely flat. And you’ll notice that I didn’t have the spirit to replace the wing machine guns as I had planned. But hey, it’s done, and it looks halfway decent with Starfighter Decal’s markings and a bit of weathering. Like most of my models, it looks really good…from a distance of 10 feet. 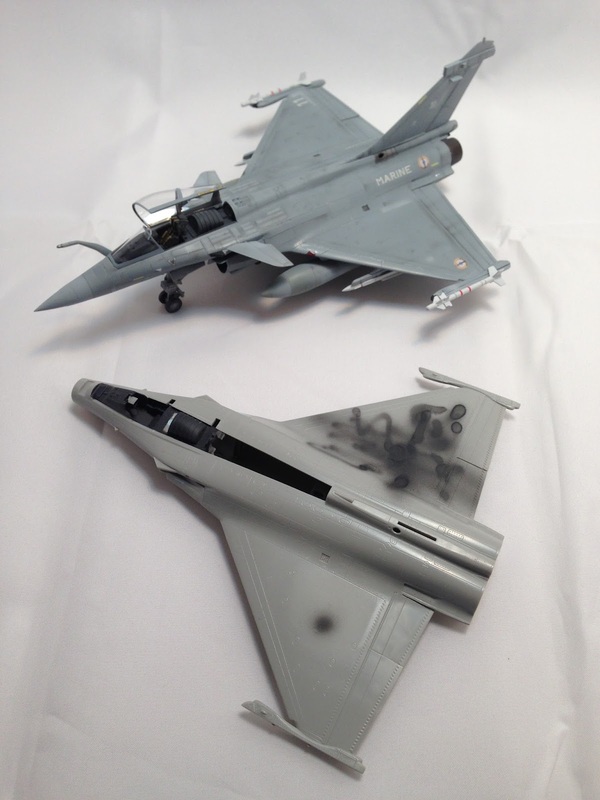 The other hot mess that’s consumed the better part of my time at the workbench this year is Hobby Boss’s Rafale M. Unlike the Airfix Hawk I didn’t set out for it to be a super-detailed model, opting to use only an Eduard Zoom set, so I wasn’t expecting to struggle with it as much as I did. I blame my own lack of foresight as well as Hobby Boss’s poor instructions. The remains of another failed project. The engineering of the fuselage is a bit complex with multiple pieces coming together resulting in many seams that need to be addressed, much like most of the F-4 Phantoms on the market. I failed to fill the seam that runs the length of the forward fuselage before I attached the intakes, so cleaning it up would’ve been extremely difficult. And it was only after I’d attached the intakes that I realize the lack of intake trucks meant there was a HUGE void when you look into the intakes. Now I’m not one of those guys who obsesses over intakes, but this was too much. I also realized too late that you have to install the main landing gear BEFORE you join the upper and lower fuselage halves. The instructions don’t make that clear, so between this, the labor required to properly address the seams, and the black hole behind the intakes, I decided to scrap the model. Like the Airfix Hawk, I bought a replacement kit and started over. The result was much better the second time around, even if my spirit was slightly broken. The rest of the project went well, and the model looks good if I do say so myself. I like the look of the GBU-24 under the aircraft, but I didn’t have the energy to scratchbuild the targeting pod that’s mounted behind the starboard intake. So, what can you learn about my experience with these two kits? Read reviews and WIPs of the model you’re planning to build. 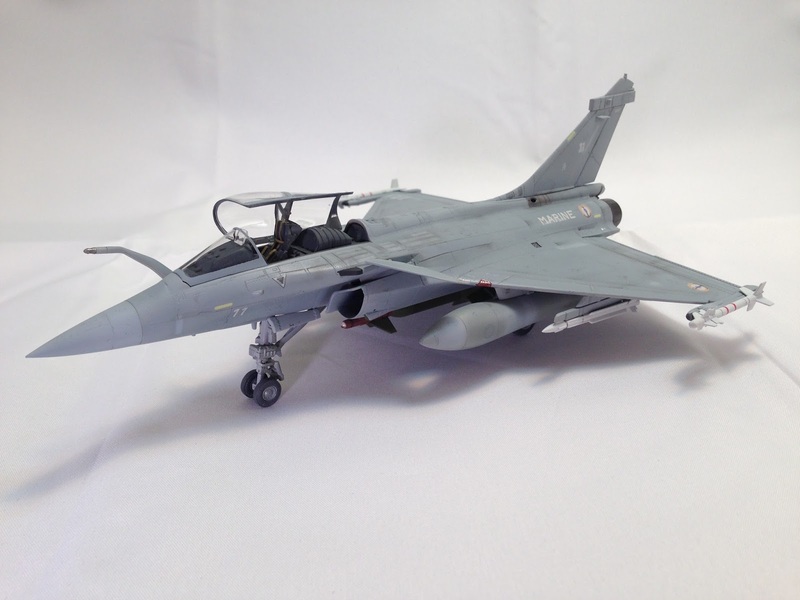 A modeler on Brit Modeller who built the Rafale pointed out the issue with the landing gear, but I hadn’t seen it; if I had, the project might have gone a little smoother. Carefully study the assembly of the model before you start it. Determine where the seams are going to be and how other parts will affect your ability to fill them. Look at the assembly sequence and don’t assume that the model will go together exactly as the last 20 models you build. Consider removing the major parts of the model from the sprue and temporarily assembling the model to see how it looks. Finally, don’t hesitate to scrap a model that’s not going well. You could argue that the time you’ve invested in the kit is wasted, but I believe that any time at the workbench is time spent improving your skills. As long as you’re learning from the experience, you’re on a good path. A short post from last year about the length of the gear legs. I was surprised no one had mentioned it before.